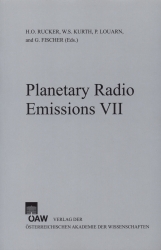 The 7th International Workshop on "Planetary, Solar and Heliospheric Radio Emissions" is the continuation of an established tradition: This PRE VII conference followed previous successful international workshops held at Graz, Austria, in 1984, 1987, 1991, 1996, 2001, and 2005. This 7th workshop in September 2010 offered again the unique opportunity to discuss the observations from Cassini at Saturn and to investigate the measurements by other spacecraft and from the ground of the Jovian, terrestrial and solar radio emissions, also including studies on radiation from exoplanetary sources. A procedure to combine radio data from the Low Frequency Array (LOFAR) [ASTRON, 2010] and the Giant Ukrainian Radio Telescope (GURT) [Konovalenko, et al., 2009] is described. LOFAR is being deployed with 36 stations in the Netherlands and 8 international stations in the neighbouring countries where the central 18 stations close to Exloo in the Netherlands form a core. Data from the Low Band Antennas in the frequency range 10–80 MHz (10–30 MHz with reduced sensitivity) of the LOFAR station in Bornim close to Potsdam, Germany, 1,500 km from GURT will be used. GURT is being built at the site of the UTR-2 radio telescope close to Charkov, Ukraine. It covers the range 10–70 MHz and the final effective area of GURT will be comparable to the LOFAR core. The GURT data will be converted into narrow bands of the same bandwidth and the same centre frequencies as the LOFAR data. Comparisons of the dynamic spectra from the two stations will be made and the data from the stations can be combined to make use of the long baseline. Scientific focus will be on solar physics within the LOFAR Solar physics and space weather key science project, but the long baseline also allows for investigations of radio sources which require a higher angular resolution than the sun.